What is it that takes you from casually thinking a certain recipe might be good—from dog-earing the page, or mentioning to the person sitting next to you, "Oh, that looks good,"—to the action steps of writing down the ingredients, going to the grocery store and making the recipe come to life? For me, it starts with a photo. I need an image of the finished product for inspiration. But, it goes far beyond that. If there's one thing I've learned from this blog, it's that the photograph needs to do more than just entice me with flavors or rather the idea of the flavors as imagined in my head, it must also win me over on a less conscious/more psychological level, a level that asks the question: does this recipe suit the kind of life I imagine myself living? Martha Stewart recipes almost always hit it home when it comes to meeting the needs of this latter element. Take the below photo for example. The moment I saw it, I was committed to attempting the recipe. It's just magical—the way the souffle has puffed out of the ramekin, kind of on a tilt, like it's tipping its flat, perfectly browned hat to me. Anyone who could produce eight of these (presumably) after already serving a majestic main course and elegant appetizers, clearly knows something about living life. Don't you want more than anything to break through that crispy top layer with that well-placed spoon and take a bite? Doesn't the image seem to exude an air of organized optimism? Isn't it an absolute food dream? I match your disappointment and raise you one major bon appetempt FAIL. Like I told Matt before I made him watch the episode of The Bachelor: On the Wings of Love where Roslyn gets kicked out because she wasn't there for the right reasons: Let's just get through this, OK? So, this was another recipe I did with Mom back in Pittsburgh. This explains the existence of eight matching individual baking ramekins. This is also possibly where one of the major mistakes occurred. Obviously, the whole thing about souffles is that they are supposed to rise like crazy, so each ramekin needs a good buttering and then sprinkling of sugar to keep them from sticking, however, and I don't know if this really counts as a huge mistake or not, but after we did this, Mom read off a little note along the side (but not included in the main directions area) that said: To help them rise properly, use upward brush strokes to butter the dishes. Sooo, there was that. There was also the failure of our egg yolk to turn thick like "a pudding" after whisking for one to two minutes. At the time, I didn't think it was that big of a deal, but afterward, Mom shook her head and said: "I knew we didn't get the egg yolk mixture thick enough." I don't know, though. The recipe said that you could make these ahead of time by leaving the uncooked mixture in the ramekins for up to three hours and then just pop them in the oven after dinner, which is basically what you'd have to do if you were having a dinner party for eight since souffles must be served immediately, however, I believe we should have run a knife around the edges before we placed them in the oven, thus freeing them for their big rise. Again: I don't know, though. I do know that ours did not rise at all. They puffed up a little like a normal cake. That was it. I pulled them off everyone's place setting and put them back in the oven and though this second time, they were no longer soupy and disgusting, the taste was still not great. More than lemons or sugar, I tasted the egg. And for the first time in recent memory, I wanted nothing to do with my dessert. Seriously, no one cleaned their ramekin that night. Sorry, family. The (arguable) good news? I'm fascinated with the souffle now. Already wrote down the recipe for a savory, non-individual one. BUT first up will be something for a bake sale for a good cause! Cookies Without Borders: A Bake Sale for Haiti. WHERE: Scoops Gelato. 712 N Heliotrope Dr. 90029. In East Hollywood, just north of Melrose, between Normandie and Vermont. LOVE TO BAKE? If you love to bake and want to donate a few of your favorites, WE NEED YOUR HELP! Let these guys know and they'll give you more information. For souffle recipe, click HERE. I also like recipes that are accompanied by great pictures and almost any that are pasta-related. Also, I tasted this souffle and it wasn't great, but... I can't wait for your next one. OK, so having recently received ramekins for my birthday I have probably read every section of all of my cookbooks on how to make souffles. I strongly recommend the Williams Sonoma Dessert Cook Book, they have several souffle recipes, and the Gran Marnier recipe is divine. It is orange-y and booze-y, which is a nice combination and not overly egg-y. good luck finding a souffle recipe you like! Oh I love stopping by for some good 'real' honest reviews! Love it...and yes...that is so how it is most of the time for me...totally opposite of the gorgeous pictures. How many times do they try to get it just right? Or is it a totally different recipe? A conspiracy me thinks. Grin. Yet to make it on my repertoire....souffles. Have you ever had a Martha Stewart success? Have ya? I LOVE the new banner! The souffle looked a little funky. Can't wait to see your next attempt! Jennifer- thanks for the recommendation! will check out for sure. Jessica- Thanks! trying it out for a change of pace. Thank you for making me feel a little less alone in my colossal cooking failures. And thank you for the info on baking for Haiti! I'm an East Sider as well and just signed up. Clearly your history of cooking successes suggests that you are an accomplished baker and chef. I have to agree with Mary Anne...I think something is up with the Martha Stewart recipes...are they even using the same recipe they advertise??! oops- that above post was from me. Thanks for the vote of confidence Anna! Yeah, something is fishy w/ the Martha Stewart recipes, and their pictures definitely seem a little doctored?? Thanks for the step-by-step breakdown of this recipe. Your advice on what to do and not do (ie make sure the yolk mixture is thick enough, butter ramekins with upward strokes) helped me pull off this recipe this weekend. I'm positive these wouldn't have turned out at all if I didn't find this blog. Maybe you should try them again? Kari: hurrah!! and congratulations! I am definitely going to try souffles again asap. They are simply too magical to forsake for too long. I have made souffles three days in a row recently and they all rose very well but the reason I repeated so many times was because I wanted to make a slightly richer strawberry souffle instead of the traditional super light fat free ones. 1. Make sure you butter your ramekins REALLY well, don't melt the butter completely as they will tend to accumulate at the bottom of the ramekins. Easy way to soften butter is to leave them close by the hob as you were warming the milk or cooking the custard mixture until they're as soft as your skin. Then, make sure you dust the ramekins really generously as well because that will prevent your souffles from sticking to the side walls and clearly that is going to prevent the rise. 2. The second tip one that most people know. Make sure your egg whites are beaten to firm peaks but NOT over-beating it. Good way is to check constantly after you've reached soft peak by quickly pulling your whisk out of the meringue and if the peaks stay where they are without folding over you're there. WHISK in the first half of the meringue mixture to loosen your batter and then fold in the rest gently. This makes it so much easier to fold and takes less 'folds' and thus knocks out less air. Hope this helps. 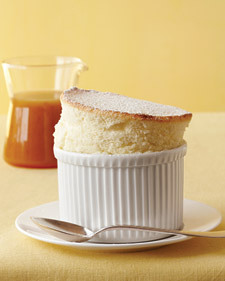 Also, as you make the creme patissiere, add an extra yolk to give your souffle a better golden exterior.